Learn at your own pace, from the comfort of your own home. DDC Online is a 4-hour online course based on the same content used in the National Safety Council instructor-led Defensive Driving Course — the most widely used driver safety program in the world. 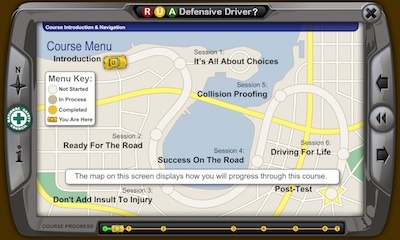 Through animation, narration, video and interactive exercises the online defensive driving course offers an engaging, interactive learning environment where students analyze real driving situations, spot driving hazards, and identify the correct defenses. have taken the DDC Online course!